One of the UK’s Leading Suppliers of Asset Labels! Used by companies, educational establishments and government organisations, asset labels are a great way to track equipment and deter theft. From one item to a thousand asset labels are a great method to track and monitor your equipment. With many different materials and printing methods available in house, here at Lotus Labels we can offer a versatile solution for your asset label needs. With materials such as polypropylene and polyethylene we can provide you with an asset label that can withstand extremely harsh conditions. 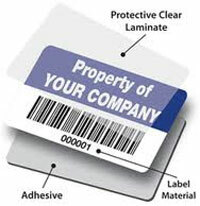 Lotus Labels can help you securely mark, track and identify your assets with asset labels. The Asset Labels we offer are high quality, cost-effective and can be customised according to your requirements.